Michelle Magnani, 26, and Keyon Wellington, 41, face felony counts after their arrest in Scarborough. Maine State Police arrested a Connecticut couple on the Maine Turnpike in Scarborough Friday and charged them with drug trafficking. One of the suspects, Michelle Magnani, 26, of Meriden, Connecticut, is six months pregnant, state police said in a statement posted on its Facebook page. 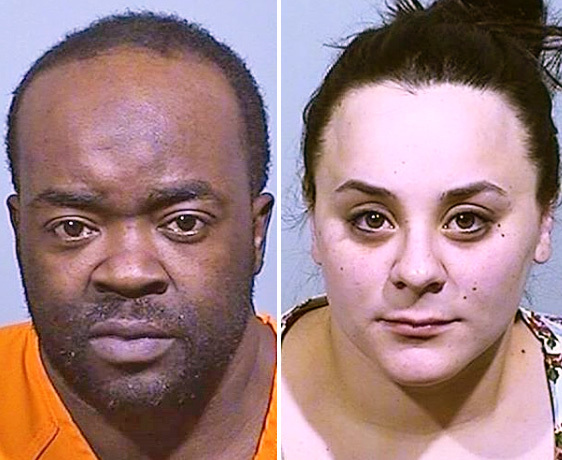 Magnani and her boyfriend, Keyon Wellington, 41, of New Britain, Connecticut, were each charged with two counts of Class B trafficking of drugs, a felony. Magnani, who was operating the vehicle when state police pulled it over, was also charged with operating without a license, state police said. Magnani told officers that she was taking her boyfriend to the Hollywood Casino in Bangor for a weekend getaway, but troopers were not buying into her story. “Multiple criminal indicators were present,” state police said in the Facebook post. They said officers deployed a narcotics dog, which sniffed the presence of narcotics on Wellington. “Subsequently, 17 grams of suspected cocaine and 8 glassine bags of suspected fentanyl were located inside the vehicle,” state police said. Fentanyl, a synthetic opioid painkiller, is much stronger than heroin. The U.S. Centers for Disease Control and Prevention says fentanyl is up to 100 times more potent than morphine. It is sold through illegal drug markets for its heroin-like effect. Magnani and Wellington were arrested and taken to the Cumberland County Jail in Portland. The arrests took place at 2:30 a.m. Friday.